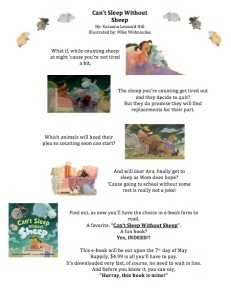 The Can’t Sleep Without Sheep E-Book Launch Jingle Contest! 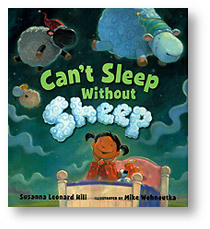 And today’s contest is happening because tomorrow, May 7, Can’t Sleep Without Sheep is coming out as an E-Book!!! 2. Face Book post, Tweet, and/or blog that Can’t Sleep Without Sheep is coming out as an E-Book for all platforms, including links (which won’t be available until Tuesday May 7 when the e-book is actually available – I will add the links to this post as soon as I have them.) Make sure to tag me on your FB posts (Susanna Hill), mention me on your tweets (@SusannaLHill), and email me at susanna[at]susannahill[dot]com to tell me you blogged so I can keep score. You may post, tweet and blog to your heart’s content all week – May 6 – May 14 at 9 PM EDT – and you will receive a point for every single one! All winners will be announced on Wednesday May 15! Now. Fasten your seat belts. I have a sample (don’t I always? ), maybe two! And I also have an entry from Ruth! Great Scott it took me about two days to get this to load! I hope it’s running properly. You might have to turn your volume pretty high… Fingers crossed it works! And may I just say that Ruth and I struggled mightily to get something up that worked. This is her third effort. I’m sorry the first one with sound wouldn’t load properly, but isn’t this beautiful and fun? Would You Read It Wednesday #87 – Story Bored (MG) PLUS Straight From The Editor and The April Pitch Pick Winner! Glad I stopped by to 'set a spell'…as the Clampett's would have said. 🙂 Your second video is awesome, Susanna and I loved Carrie's jingle also. 🙂 I don't think I had commented on Ruth's…what a lot of work…it is lovely! Now I'll click on the new links and read the additional entries.